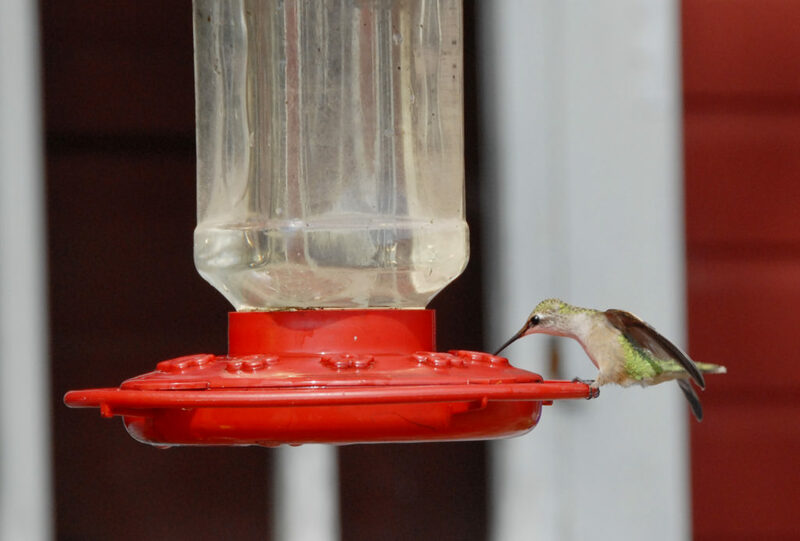 Forget the pricy colored water at the store, hummingbird food is easy to make and use in hummingbird feeders. Experts agree that the best ratio for hummingbird feed is four parts water to one part white granulated sugar. Even if you are avoiding using regular white sugar in your own diet, it is the best thing for the birds. White granulated sugar contains sucrose, which, when mixed with water, closely mimics the chemical composition of natural nectar. “It turns into a brown syrupy gunk in your feeder that is so viscous they can’t drink it, and it is hard to clean,” Bassett added. Also avoid the temptation to brightly color your homemade nectar with food coloring. Many store bought hummingbird food is tinged with red food coloring under the auspice of attracting birds. “If it’s a hummingbird feeder a hummingbird will figure it out,” Bassett said. “I’ve seen ones that i had no idea were hummingbird feeders.” Bassett recalled a hummingbird feeder he once saw that resembled a lighthouse. There is another concern when it comes to feeding hummingbirds: bugs. Bees and ants enjoy sugar water about as much as birds and may start to overrun your feeder if you do not manage it well. “It isn’t always obvious when you buy a feeder which one has liquid below the port and one doesn’t,” he admitted. If bee problems persist, Hawkins suggested filling one feeder with a five to one ratio of water to sugar and the other with a higher concentration of three to one. “Bees love the three to one and will go there, and the hummingbirds will go to five to one,” Hawkins said. If the hummingbirds had their druthers, he explained, they would likely go for the sweeter water, but they are happy to congregate around the less sweet option to avoid bees. “They really divide it up,” Hawkins said. Cleaning is an essential part of maintaining your hummingbird feeder for the health of the birds that stop there for a snack. Try to hang your feeders in the shade to prevent them from fermenting, and only fill your feeder with as much food as the hummingbirds will eat every few days between cleanings — this will entail some observation on your part, but starting with half full is a safe bet to start — to prevent mold.